The weather this week has been beautiful with temperatures in the mid 80s to low 90s with a light breeze to cool it off a little bit. Surface temperature has dropped down to 79 degrees. The hot bite this week has been striper with many anglers coming back with limits. Striper has been the easiest to catch this week. Most anglers are using anchovies, chicken liver or sardines. The dam has been a really good spot for stripers lately; I would recommend fishing in 15-20 ft of water at the most. I would also recommend fishing in Swallow Bay. A few anglers have mentioned that they have caught one or two early morning striper or top water. Black Bass have been doing really well lately, most anglers are catching them off of either senkos or paddle tail swim jigs. I've had anglers tell me they have been hitting top water early in the morning and also spinners throughout the day. Our good friends Doc Al and Abby Lev came out this week and here is their report. " John Foster of Saratoga, Al Hurwitz of Saratoga, and Abbey Lev of Sunnyvale trolled the Lake on 8/3/17. We used 1/4 oz. Panther Martin Spinners in silver (chrome) and gold blade patterns, trolling 5-15 feet below the surface. We hooked up with 20-30 Smallmouth Bass (our target fish in the summer), most of them small in size, but with a couple of decent ones thrown in. Scent on the spinners seemed to help. The majority of the fish were caught along the eastern shoreline between Swallow and Heron Bays just north of Swallow Rock. The fish were mostly in a 20-25 foot water column and were locked in a thermo cline 10-15 feet below the surface. We were trolling at a speed of 2.0-2.4 mph. All the fish were released. Other methods used to catch "Smallies" include drop shotting with plastic worms and casting spinners and plugs against or parallel to the shoreline. It's a lot of fun to go after this great fish and practice catch and release to protect the resource. 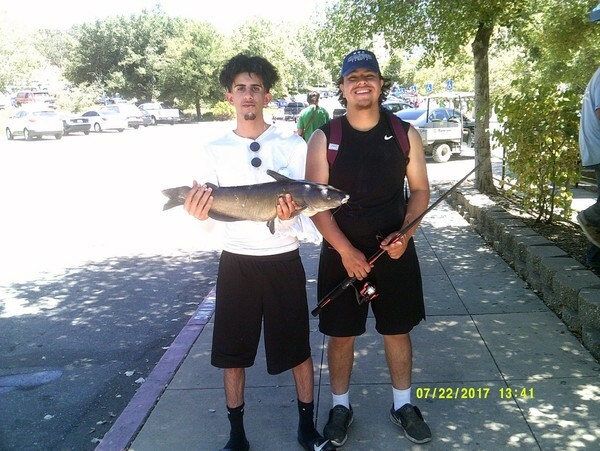 All the best, Dr. Al Hurwitz"
Kenny Khu of Livermore caught 2 stripers, each weighed 5 LBS Travis Walker of Redwood City caught 1 striper she weighed 17 LBS Steven Robles of San Jose caught 1 striper that weighed 2 LBS. 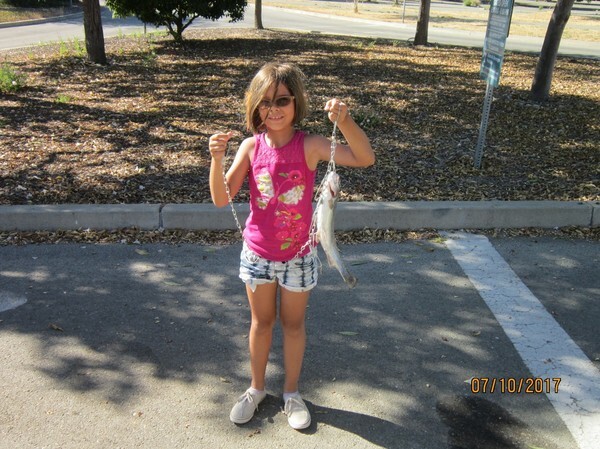 Blake Tonelli and Guliana Tonelli caught one striper that weighed 3 LBS and one catfish that weighed 12 LBS.